Woodland Shores: Lees Summit luxury Lake living at unbeatable prices. This new Lees Summit community overlooks beautiful Prairie Lee Lake. Here you can enjoy a full spectrum of lake activities, from speed boating and water skiing, to sailing, fishing and jet skiing. The Woodland Shores Lee's Summit lake homes development is designed with the discerning new home buyer in mind. Our luxury lake houses for sale in Lee's Summit, MO, are private homes with unique architecture. They start at just $350K. It gets better, though -- each one of our lake homes creates an individual experience. Discover our unique homes: To tour a Woodland Shores lake home for sale, call (816) 537-7000. Your new home in Woodland Shores would be conveniently located in Lee's Summit, MO, around a lake community with miles of rolling parkland. Homeowners benefit from the Woodland Shores boat dock and swimming pool amenities. In addition, walking and bike trails meander throughout the area. This beautiful luxury lake home neighborhood is an enclave nestled amongst literally thousands of acres of parks and lakes. With lots of houses for sale, you're sure to find the perfect match. Envision yourself in a lake home. Enjoy the fresh air as you walk down to the dock, or start the morning with a dive in the lake. Living in the Lee's Summit lake homes neighborhood of Woodland Shores is a treat for water lovers and outdoor enthusiasts. Your Lee's Summit lake house provides easy access to fishing docks, pontoon boats and swimming areas. You'll also see native wildlife and natural terrain as you walk through the beautiful lake houses for sale that are lining our neighborhood streets. Located in the heart of Lee's Summit, MO, our lake home community is also close to several conveniences in Lee's Summit such as local shopping and restaurants. What makes these homes unique? Woodland Shores' lake homes are not simply new houses churned out by a production builder. At Woodland Shores, each house for sale boasts significant benefits. We do more than build lake homes; we make dreams come true. All of our houses for sale are custom built by premier builders in Lee's Summit. Each home has a distinctive look and feel that is well-planned and thought out. From the exterior elevations through the interior spaces and fine detailing, you will fall in love with the place that you will call home. We place high standards on our home builders and guide all facets of construction and development of your Lee's Summit home. Often times new subdivisions tend to build homes that all look similar and alike. In Woodland Shores, your home will have a custom and unique look that differentiates you from your neighbors. The individual nature of each of our homes is a great value. We maintain architectural individuality for each house we build. We offer multiple floor plans at Woodland Shores so that you're not just satisfied with your new home - you fall in love with it. We build so that your initial investment is protected over time, and so that you'll truly have a place that your family will be comfortable to call home. Our Lee's Summit lake homes offer distinctive, informal architecture that aims to create a relaxed, recreational community in a park-like setting perfectly in keeping with upscale Lee's Summit. Our stunning architecture is breath-taking and relaxing at the same time. Our lake homes are built to complement the beauty found in nearby Prairie Lee Lake, Lake Jacomo, Fleming Park, Legacy Park and surrounding Lee's Summit. Woodland Shores is nestled in the prestigious Kansas City suburb of Lee's Summit, Missouri. Not only is the lake community located within the nationally acclaimed Lee's Summit School District, but it's also housed in the community with the nation's best downtown area and parks & recreation department. Lee's Summit, MO, is also one of the best places to live in the United States. While the amenities and conveniences of a fast-growing suburb are minutes away, Woodland Shores is located in a pleasant lake community that offers walking paths, swimming pools, boat docks and more. It truly offers the best of both worlds. It will only take you one second to drive through our community before your breath is taken away. Woodland Shores not only offers beautiful homes, but we take pride in our exquisite landscaping as well. From nature's finest trees and shrubs to beautiful flower beds and stone walls, we ensure that our community maintains the same standard of beauty that is set by its natural setting. Woodland Shores: Lee's Summit is surrounded by jaw-dropping, natural beauty. Rarely do you find a lake community with quiet and natural elegance that is also located near such conveniences. Lee's Summit's new family recreational complex Legacy Park is directly across the street from us. Lake Jacomo and Fleming Park, some of Jackson County, Missouri's lakes, are only minutes away. Our homeowners walk out onto their patios to overlook Prairie Lee Lake. Quality and natural elegance are reflected throughout this exclusive lake community, and you'll be proud to call it home. It's not easy to always find your dream home, but we make it simple. With tons of houses for sale along our signature shoreline, there is something for every Lee's Summit homeowner. 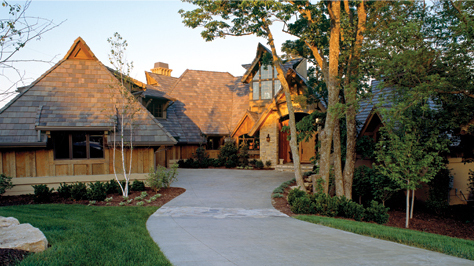 To tour one of Woodland Shores distinctive Lee's Summit lake houses for sale, call (816) 537-7000.